Christine’s timing is impeccable! Just as I was trying to decide what recipe to post this week, she emailed me her latest recipe submission for The Armenian Mirror-Spectator and asked if I’d be able to post it. I am always delighted to share Christine's recipes. In fact, I am happy to share favorite Armenian family recipes from any of my readers - hint, hint! This recipe can be oven-baked or made on a grill. Either way, it's one we hope you'll enjoy! Prepare the sauce: Combine all ingredients for the Yogurt Cucumber Sauce in a medium glass bowl, cover, and refrigerate until ready to serve. Prepare Garbanzo-Pepper topping: In a food processor or bowl, mash the garbanzo beans until soft; add the onion, tomato, bell pepper, tomato paste, garlic, lemon juice, and olive oil, and mix to combine. Add the parsley, and season to taste. Place the pitas on a parchment-lined baking sheet. Spread about 1/4 cup of the bean- pepper mixture to cover each pita; drizzle lightly with olive oil. Bake pitas for 10-12 minutes or until crisp and golden brown, and remove from oven. Serve with Yogurt Cucumber Sauce. To serve: Top pitas with crumbled Feta cheese, sliced red onions, and roasted red peppers, if desired, and fresh lemon wedges on the side. Prepare bean-pepper topping and yogurt sauce ahead of time. Lightly oil the grill grates. Turn grill on to medium-high. 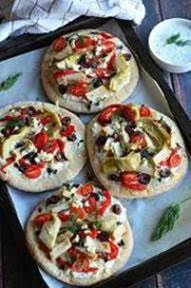 Lightly brush olive oil on each pita; spread garbanzo-pepper topping on each, covering the surface. Place the pitas on grill grate; close grill cover and grill for about 5 minutes. Check periodically to make sure pita crusts aren’t burning. Serve immediately with yogurt sauce and optional toppings.